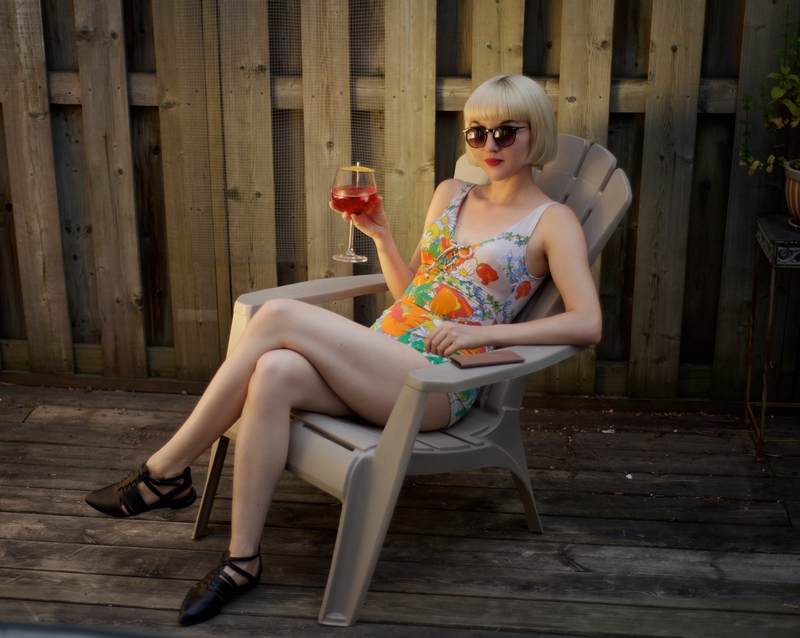 These photographs of me in my vintage bathing suits were taken on the shared rooftop patio of our apartment in downtown Toronto. Although the air in our neighborhood is unpleasant — the smell of garbage and piss is a fairly dependable consistent — I feel very lucky to be able to live in such a wonderful space with some solid neighbors. Our upstairs neighbors are actors from Calgary, and me and my partner are both artists from Regina: together we form a little prairie diaspora in Toronto, a city that on the one hand we like for what it encourages in our respective practices and creative output, and on the other hand resent for its air quality. Prairie kids in the big city. What are they to do? One idea is to cultivate spaces within which micro-communities can come together. I think of queer place-making practices, for example, and the work of my friend Anthea Black, a Toronto-based artist whose work features in a queer feminist zine I have curated entitled SELF CARE FOR SKEPTICS. Feel free to check out the zine here (http://laurenfournier.net/Self-Care-for-Skeptics-Zine). Of course, the case of queer place-making practices is much more serious than my desire for fresh air — queer place-making emerges from the fact that patriarchal and heteronormative societies continue to pose very real threats for those who do not fit into what are their perceived gender roles or identifications: for example, those who identify as transgendered or genderqueer. I wonder how much my longing for good air quality and beautiful green spaces (and safe space) comes from a sense of privilege and entitlement, and how much is valid. And then I realize that the question of privilege in relation to this question of air quality and natural environments is quite complicated. My body longs for the west coast air, and yet I (along with countless others) do not know if I will ever be able to afford to live there long-term. I found this paisley one piece bathing suit at Mintage on Commercial Drive in Vancouver. While the original tags are missing, I believe this bathing suit is made of a rather thick combination of spandex and cotton. It feels like a piece of wearable sculpture: an entirely different texture and weight than contemporary bathing suits. I particularly like the way it dips down low in the back, as well as the small skirt-like adornment. 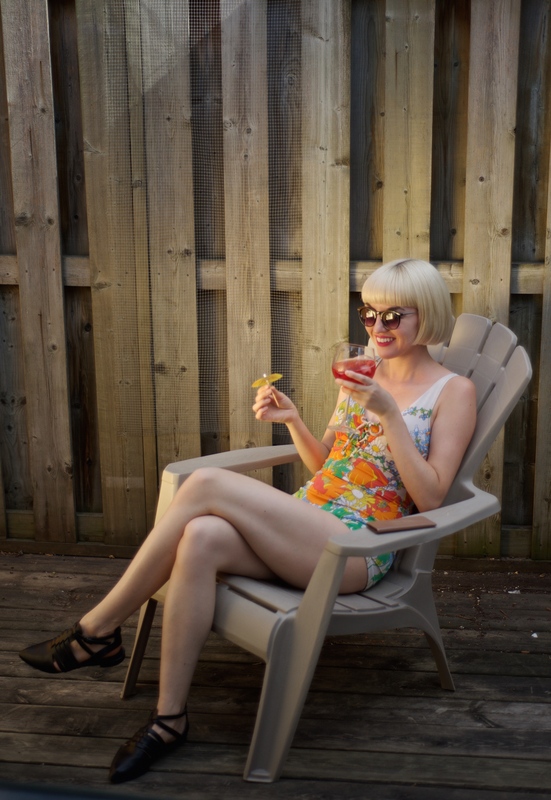 I loved wearing this bathing suit when I had a violet-grey pixie cut in Vancouver, but I also think it looks great with my blonde bob. I found these sunglasses at a flea market in Prague last summer: I paid less than 10 Euro for them, and they have lasted me for two summers now. I tend toward purchasing cheaper sunglasses, as I get nervous about the prospect of losing or sitting on an expensive pair. 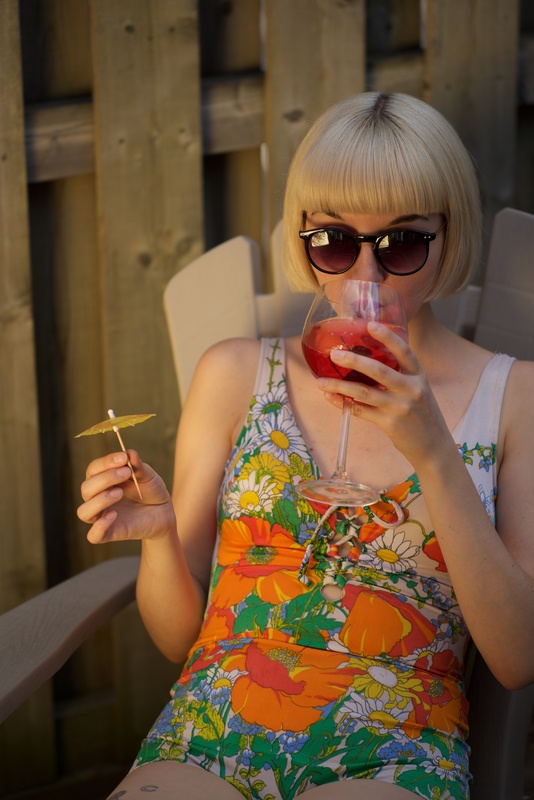 Pictured at the top of this article, the 1970s floral one piece, complete with the pronounced cups, is from Community Thrift + Vintage in Vancouver’s gastown. I fell in love with this pattern when I saw it, and was happy to see that the suit fit my body. The fabric is thinner than the brown paisley suit, and more closely resembles how contemporary bathing suits feel. That being said, the fabric feels more durable: I am impressed at how generously it moves to fit my body, and how well-maintained the coloring and pattern is after over four decades. 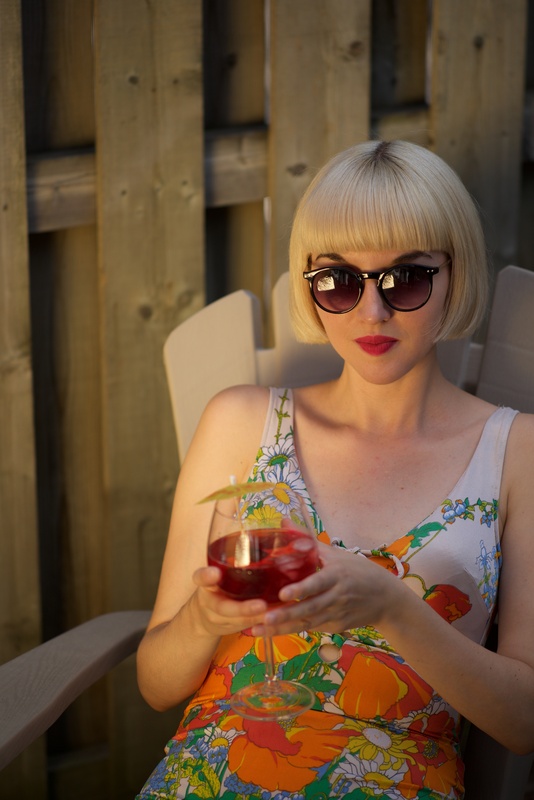 ← NEXT SALE – Regina Folk Fest!